It is told from three perspectives, namely Land, Sea and Sky referencing the Winston Churchill quote "We shall defend our Island, whatever the cost may be, we shall fight on the beaches, we shall fight on the landing grounds, we shall fight in the fields and in the streets, we shall fight in the hills; we shall never surrender." Though told from the three perspectives, the pieces fit together perfectly to create an amazing re-telling of a story which centres around the coming together of a community, the spirit of survival and the concept of home. It should be mentioned that because of the way the story is told, it can seem to move from day to night as you blink. It can be confusing and it did take me a little while to work out what Nolan had done and for my mind to settle into the way the story was being told. ‘Dunkirk’ is a film that everyone should watch. It’s an epic re-telling of an iconic, trying but hugely important time in history. The French and the British held the perimeter and 400 000 armed forces were stranded on the beach, backs to the sea being picked off from the skies by the Nazi air-force with home ‘so close that you can almost see it’ (The English coast is 26 miles away from Dunkirk). Christopher Nolan mentioned that the idea for ‘Dunkirk’ is actually 25 years old and came from a time when he and his wife crossed the Channel in a small yacht with friends which he called 'a very arduous experience' and that was without anyone bombing them. This is certainly not just another war film which is what makes it so special. There isn't a distinct hero and there is also no true ‘lead’ in the film although we do follow Fionn Whitehead’s character from beginning to end. 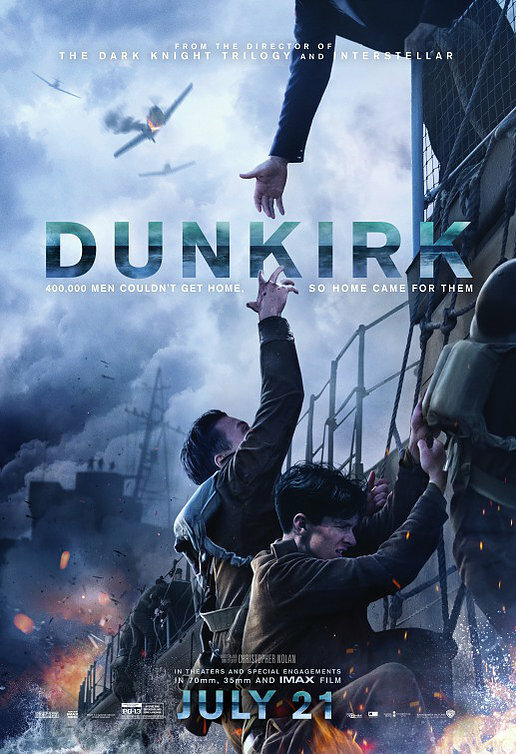 During ‘Dunkirk’ we see so many perspectives and so many heroic acts come out of what was a defeat in terms of the military but a massive victory on a human level. The film is incredibly human and I heard Nick Grimshaw describe to Harry Styles (he’s coming up soon by the way) during a recent interview how someone held the door for him on the way out of ‘Dunkirk’ and how touching he found it on a human level. I had exactly the same experience when leaving the cinema and felt that same warm feeling. I think one of the most brilliant things about this film is the human element. There are some amazingly human moments in it. You see the anger and the fear that comes from war. One of the moments which stood out to me most was a soldier saying that when it’s about survival and it’s between me or you, I choose me. There’s also a touching moment where when the tide turns and the bodies of the dead start floating back in, the soldiers line up in the sea and gently push them back out. It’s a harsh reality that nobody really wants to face up to. I won’t lie to you, I came out of that film quite shocked and feeling as though I had fought to survive myself. It is a hard film to watch and it should be, it’s meant to be. War shouldn't be romanticised nor viewed through rose tinted spectacles. It should be like this…tense, nail-biting and in all honesty awful. It is in no way what I would describe as a feel-good movie (although there are some heart warming moments) and I would suggest watching it a while before you aim to go to bed. I might even suggest seeing the show in the afternoon and chatting through it over dinner. It’s a film that needs to be spoken about and as hard as it was to watch the first time around, I really feel the need to see it again. Fionn Whitehead and Harry Styles are both an absolute triumph in the film. It was Fionn’s first film and his debut ‘lead’ movie role if you want. He is absolutely outstanding throughout and I can’t wait to see more of him. The fact that Christopher Nolan almost creates this time-bubble by not allowing mobile phones on set means that the actors are not separated from the world which Nolan creates and it only serves to improve the movie. It always feels like the actor's real reaction, like you're looking right into history. Casting Harry Styles was what some might have called a risky move but he really is so bloody good in ‘Dunkirk’. There is no trace of Styles’ boy band days nor flamboyant style in his portrayal of his wartime character Alex. Having Styles in the film was such a brilliant move (one that I think Nolan didn't fully comprehend upon casting him) he has legions of fans from his One Direction days, most of whom have stuck with him through to his new solo career and of course, they will go and see Dunkirk because of him. That’s brilliant because in casting Styles, Nolan exponentially expanded his audience and brought young people in to see a movie that they wouldn’t necessarily have seen had Harry not been cast. Another reason that the casting of Whitehead and Styles is so important is the age. Styles is 23 whilst Whitehead is just 20. It really puts into perspective how young the men who were sent to war were. Some were even younger, just teenagers, only children when they went to war. It’s difficult to watch young men battle day and night just to survive and it is at odds with what life is like now. This film plucks you from your cinema seat in 2017 and puts you straight into Dunkirk 1940. I must sincerely congratulate Nolan as this film is an absolute triumph. His cast is amazing and I cannot think of another film that I could possibly encourage you to see more. It is difficult to watch, it’s raw and emotional and you won’t come out of the cinema ‘happy’. This is a film to change perspectives and to bring the past to life. PS: Dunkirk is now the number one movie in the world!